With over 250 full service yards, TXS, INC. is the first organization in the country committed to providing secure 24/7 trailer parking & drop yard staging services on a national scale. TXS provides a national network of facilities which offer logistics companies, intermodal servers, and over-the-road/for hire carriers, a dependable, safe and driver friendly operation that is dedicated to supporting and servicing their fleets anywhere in North America and Canada. Our emphasis is to assist in the prevention of cargo theft through the design of our facilities and operational protocols. In addition to secure trailer parking, TXS provides long-term storage solutions for large fleets of equipment with perimeter security, video surveillance and motion detector monitored sites 24/7. Visit our website www.terminalexchangeservices.com for more information and full list of services. 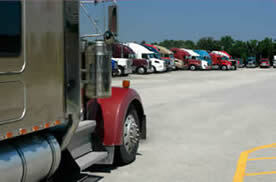 With over 330 independent, contracted, and company owned facilities throughout the United States and Canada, Terminal Exchange Services is well on its way in establishing the very first National Wireless Reservation Network www.securetrailerparkingnetwork.com whereas truckers or their dispatchers can go online or to their smart phone and reserve a safe, secure tractor/trailer space anywhere in the United States or Canada at any stage in route to their final destination of their delivery of cargo. Whether it is secure parking for loaded Intermodal containers on chassis or storage and staging for over-the-road, “for-hire”, Truckload Carriers, TXS Inc. can provide secure equipment parking, staging and additional services virtually anywhere in the Country. In addition, reefer trailers/containers (temperature controlled cargo) gen-sets can be monitored while staging. All while providing the absolute best standard of security in the industry. Our mission is to protect the cargo, the equipment, and most importantly, our client’s drivers wherever they need to be, at any time, 24/7 day or night. TXS Inc. objectives are to provide over the road and intermodal carrier’s access to shared 24/7 secure managed facilities, eliminating the burden of the heavy capital expense of owning, staffing, and maintaining an exclusive use, self-staffed facility. By doing so, carriers can utilize their operating budgets to open more lanes and service more shippers by taking advantage of our multiple locations. TXS’s motto is to do this: “One yard at a time”.